With the local council elections and the snap general election just around the corner, we thought it would good to have our ‘Document of the Month’ for May run along a similar theme. This month we are going to focus on our Stirling County Council records concerning temperance polls in Balfron and Killearn. So what was a temperance poll and why did a vote take place? The temperance movement in Scotland began in 1829. Simply put, the movement’s goal was to seek restrictions on the consumption and sale of alcohol. In 1913, the Temperance (Scotland) Act was passed allowing local areas to hold votes on whether their area would permit or prohibit the sale of alcohol. Parishes throughout Scotland held multiple temperance polls. Kirkintilloch famously remained dry until 1968 after its sixth poll. It was 1920, however, when the first temperance polls in Scotland began to take place. The majority of temperance polls in Scotland were held from 1920-1929. Correspondence between the County Clerk and the Scottish Home Department confirms that Balfron Parish had previously voted to be a ‘dry’ village in the 1920s. On the 30th November 1949, however, they voted to repeal the ‘No License Resolution’. 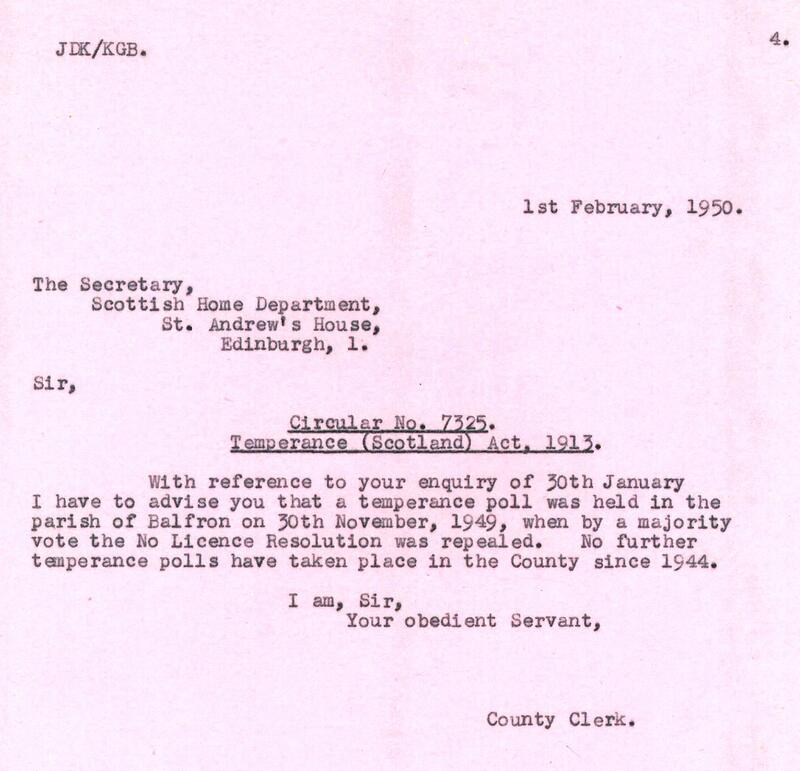 Correspondence from the Stirling County Clerk confirms that Killearn Parish held their first temperance poll on the 8th December 1925. They had voted in favour to the limit the number licenses in the parish to just one. Another vote held on 12th December 1928 resulted in the continuation of that reduction. This limitation of licenses remained in place until 1964 when the local Co-Operative and residents pushed for another vote on the matter. A total of 176 people signed the ‘Form for Requisition for a Poll’ resulting in a new poll being granted. On 25th November 1964, Killearn voted to repeal the limitation of licenses. Out the 1141 registered voters, 515 voted to repeal the limitation, 91 voted to continue limitation, and 31 voted for no licenses at all.